Being an academician, Prof. Dr. Bambang Prajogo E.W., M.S. argues that one of the ways to solve problems and contribute to the society is by conducting research persistently. As a prolific researcher, he has received various grants for his projects. Among these research projects are the utilization gendarusin A isolate from Justicia gendarussa Burm leaves as an anti-HIV substance and the production of Phytopharmaca Gendarusa capsule (Justicia gendarussa Burm.f) as contraception pills for men. 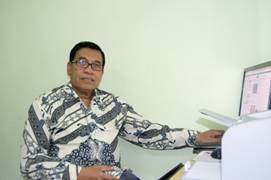 Prof. Bambang studied Pharmacognosy and Phytochemistry in 1983 at Universitas Airlangga and obtained his apothecary professional degree in 1984. He completed his master’s degree in 1984 at Gadjah Mada University. He participated in Mid-Career Training of Pharmacochemistry, Gadjah Mada University-Vrije University in 1987 and Training of Good Laboratory University de Lausanne-Switzerland in 1995. Seven years later, in 2002 he completed his doctoral study at Universitas Airlangga. “I always think about how to actualize our contribution into products. It takes consistency of doing research to solve problems. As my passion is in the field of reproductive health, I focus on making herbal medicines which are useful for reproduction, such as contraception pills for men,” he added. Five years after Prof. Bambang’s ground-breaking invention, male reproduction pills are now going to be mass-produced. 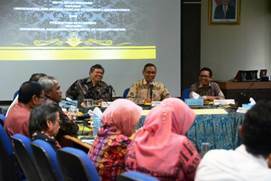 This was materialized with the signing of a memorandum of understanding by Universitas Airlangga and PT. Harsen Laboratories on Wednesday, 8 March 8 2017 in the Management Office Building UNAIR. In one year and a half, the product will be ready for the market. The agreement was signed by the Rector of UNAIR and the President Director of PT. Harsen Laboratories Haryoseno. The occasion was witnessed by the Director of Industrial Technology Development of the Ministry of Research, Technology, and Higher Education, Dr. Hotmatua Daulay, M.Eng. Haryoseno hoped that through this contraception pills, the Indonesian people’s welfare expected by National Family Planning Coordinating Agency (BKKBN) through Family Planning (KB) program can be realized. UNAIR Vice Rector IV, Junaidi Khotib, Ph.D, said that this product will change the paradigm on birth control pills or Family Planning which was previously perceived as women’s responsibility. “There will be a new paradigm. If women used to be the only subject of birth control pills, now the men are taken into account as well. It will push men to take a more active role in Family Planning program,” said the Vice Rector overseeing Business Partnership. The birth control pills invented by Prof. Bambang do not have any harmful side effects. After clinical studies, male users even experienced a surge in fitness and stamina. Aside from inventing products, Prof. Bambang has also won many prestigeous awards. One of them is the Y Prize Award given by the Y Prize Foundation, United States in 2014. His work is listed as one of the 19 tops Indonesian Technological by the Minister of Research and Technology in August 2014. Prof. Bambang was also designated as the 2014 Health Icon in Gatra Magazine.